Hostelworld Group is a global hostel-booking platform, which operates under the brands Hostelworld, Hostelbookers and Hostels.com. With over eight million reviews across 33,000 properties in more than 170 countries, this is a truly international company. Travel blogging is a key component of the company’s marketing strategy. It drives traffic to their websites, encourages people to book and underscores each brand’s place as a travel authority. 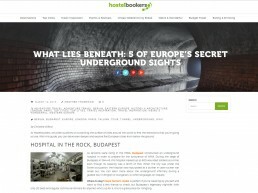 When Hostelbookers was rebranded in 2016, I came on board to provide a range of fresh content for the blog. With the brand’s target audience in mind at all times, each blog is tailored to complement Hostelbooker’s company ethos and inspire travel.